Reading Buses are claiming a new land speed record after ‘Bushound’, their standard CNG/biomethane powered low floor Scania ADL city bus, achieved a top speed of 80.78 miles per hour and an average 76.785 mph over a full lap of the banked circular track at Millbrook near Bedford. No major modifications were made to the vehicle for its sojourn at Millbrook and it was back in service in Reading the following morning. 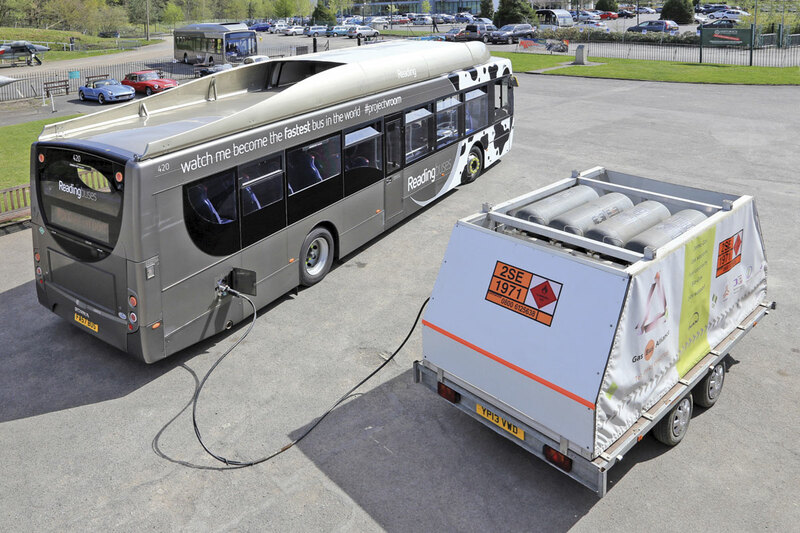 Enthusing at the success of the project which was introduced in detail in Bus and Coach Buyer 1324 (24 April 2015) Martijn Gilbert, Chief Executive Officer of Reading Buses said, ‘This is fantastic, what a great advert for biomethane which is growing in popularity each day. At Reading Buses, we love it. Thirty four vehicles, 20% of our fleet, are now CNG powered and we can’t wait for vehicle suppliers to widen their product range so that we can take even greater advantage of this carbon neutral and cost effective solution. At the project’s Brooklands launch, ‘Bushound’ was displayed alongside another speed icon, Concord. With help from their ticket machine supplier, Ticketer, Reading Buses issued the world’s fastest bus tickets, remotely sold while the bus was in motion. Over 80 tickets were issued and they will be sold as souvenirs at the company’s Open Day on June 14 when the fastest bus, with its Friesian cow inspired livery, will also be on display. The livery recognises that Reading sources its CNG sustainably from anaerobic digestion plants which produce biomethane from a predominantly ‘cow poo’ feedstock. The only modifications needed to the vehicle in support of its high speed run were made on arrival at Millbrook. These involved the disabling of the speed limiter, some remapping by Scania to increase the engine rev limit and the fitment of new tyres by Michelin to ensure this most safety critical feature was to an optimum standard. Gas Bus Alliance provided a mobile fuelling facility to ensure sufficient CNG was available to complete the Millbrook programme and return to Reading at the end of the day. The vehicle’s speed was monitored remotely in real time using MiX Telematics’ Fleet Manager system. The gas bus connected to Gas Vehicle Alliance’s mobile filling station. Alongside promoting CNG as a fuel, one of the other key objectives was to bring together the Reading Buses team. In summing up the Millbrook experience, Martijn recognised their contribution to the success of the project, particularly the engineering team, and singled out Chief Engineer, John Bickerton, who initially proposed the idea. In pursuit of the speed record, Reading Buses were sponsored by Ticketer, Nimbus, Millbrook, Scania, ADL, Gas Bus Alliance, Brooklands Museum, TEK seating & USSC, Numbercraft, Michelin Solutions, Mix Telematics, CILT, IMechE and Best Impressions. Were the new tyres fitted the same size as used in day-to-day urban operation, or were they of an increased diameter and circumference (e.g. from 275/70 to 295/80, or from either of these to 11″)?